It certainly seems to be the perfect place to live. It boasts quiet, safe neighborhoods, shopping centers, restaurants all around and is located only 20 minutes south of Mission Valley. Given the convenient access to the 805 and the South Bay Expressway 125 Toll Road, we find it easy to venture north, not only Downtown San Diego, but to the Gaslamp District, Mission Valley and all the popular attractions within and around San Diego County. Since 1986, the community of Eastlake has been a place I wanted to raise my family. It has a number of different housing developments including Eastlake Trails, Eastlake Greens, Eastlake Hills, Eastlake Shores, Eastlake Vistas and Eastlake Woods. One of the main reasons we moved to Eastlake were the schools. There are six public schools which have consistently scored in the top in their districts on all standardized tests. They all operate on a single-track year round schedule and are part of the Chula Vista Elementary and Sweetwater Union High School districts. They include Eastlake Elementary, Olympic View Elementary, Arroyo Vista Elementary, Salt Creek Elementary, Eastlake Middle, and Eastlake High School. There’s even a public library on the campus of Eastlake High School as well as a professional Performing Arts Center. There are many parks throughout the entire community, but one of the most popular is the Salt Creek Community Park in Eastlake Trails, located on Otay Lakes Road. This is where I meet most of the new mothers and families for play dates and birthday parties. This 24-acre community park features two multi-purpose fields, a skating area, a speed soccer rink, tennis courts, basketball courts and plenty of playgrounds and picnic areas. Another park which is actually designated for the residents of the Vistas is a three acre park called Mountain Hawk Park. It has the best views I’ve ever seen at any park in the San Diego County area. One of the many great advantages of living in any Eastlake community is that you don’t have to travel far to reach a large shopping center. 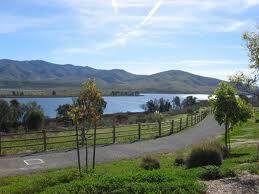 The Otay Ranch Town Center is located at Eastlake Parkway and Olympic Parkway in Chula Vista. It’s anchored by giant department stores and has been labeled a “lifestyle center” with storefronts facing a main street, which gives you the feel of an actual mini-downtown shopping district. From specialty shops to restaurants to a 12-Screen AMC Theatre, this is a perfect place to find all your shopping needs for you and your family. One other interesting site in Eastlake is the Olympic Training Center, a facility which is open year round to assist current and future Olympic athletes in archery, rowing, kayaking, soccer, softball, field hockey, tennis, track and field and cycling. So if you’re looking for a community where homes are affordable for any size family, or a safe, peaceful place to retire away from the hustle and bustle of a metropolitan city, come to Eastlake. It’s a country-like environment like no other. My familiy and I love it!